The heavy-metal band is raising funds for a "beer GWARden" and a smoke house to create their "world famous GWAR-B-Q." 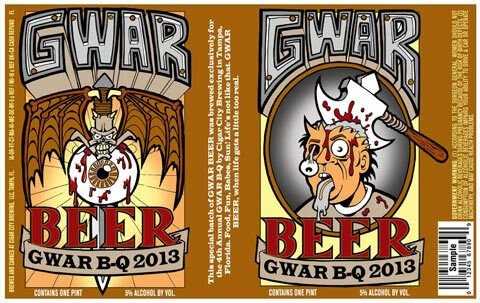 We’re hoping you’ll be able to get a pint of GWAR B-Q Beer, which was created by a homebrewer fan and produced by Cigar City Brewing, at the beer GWARden. GWAR member Michael Derks, a.k.a. BalSac the Jaws ‘o Death, is a seasoned service industry professional and will be creating the cocktail program and menu. So far, GWAR has raised $6,263 of their $50,000 goal. Go be a responsible heavy metal fan and donate, because truthfully, do you want to live in a world without a GWARbar?